The Topping Of All Is The Most Precious Metal In The World: Stutz Diplomatica! Looking for the car that will let the neighbors know you've really arrived? Look no further, my friend! 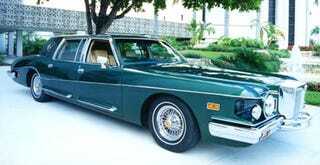 This '81 Stutz Diplomatica (one of only seven built) is available for your bidding pleasure on eBay! You say 150 Gs is too much to pay for what looks to be a Continental dipped in early-80s bling? All we're saying is: spinners.